Two University of Wyoming graduates played key roles in last week’s successful NASA test flight of a spacecraft designed to eventually take humans to Mars. Griffin Corpening, who earned bachelor’s and master’s degrees in civil engineering from UW in 1977 and 1984, was part of the Mission Management Team that guided decisions during the launch of the Orion spacecraft as well as coordinated NASA flight readiness reviews and the assessment of the Delta IV Heavy Rocket that carried the craft into space. He serves as deputy manager for technical integration in NASA’s Orion Flight Test Management Office, a position in which he will help with future Orion flight tests. Allen Bucher, who received a bachelor’s degree in computer science from UW in 1984, led the ground data system team that was responsible for making sure that all six NASA control rooms supporting the mission, and the spacecraft, were able to communicate with one another. He’s the CEO and owner of Advanced Solutions Inc., which provided the services under a contract with Lockheed-Martin, NASA’s prime contractor for building Orion. 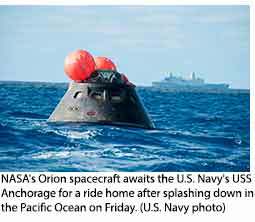 Friday’s test flight, the first time in 42 years that a spacecraft built for humans has left low-Earth orbit, was deemed a great success after Orion soared 3,604 miles above Earth and returned safely hours later. While the craft didn’t carry any people in this flight, it is designed to take astronauts on deep space missions, including to Mars, in the future. 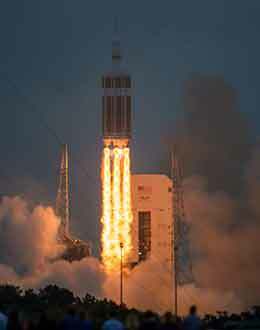 “It appears that Orion and the Delta IV Heavy (rocket) were nearly flawless,” program manager Mark Geyer told reporters on Friday. Corpening, who’s originally from Saratoga, has had a tremendously successful and lengthy career with NASA. In addition to his work on the Orion EFT-1 craft, he led the technical team that successfully flight tested the Orion Launch Abort System on May 6, 2010, at the U.S. Army’s White Sand Missile Range near Las Cruces, N.M. The system is used to provide a safe escape for the crew in the event of an emergency. Along with his work in the Orion program, he was the chief engineer for the unpiloted X-43A scramjet at NASA’s Dryden Flight Research Center in California. That scramjet traveled at a record speed of 5,000 mph, more than seven times the speed of sound, in 2004. After earning his degrees from UW, Corpening went on to receive a Ph.D. from the University of Maryland in aeronautical engineering. Before going to work for NASA, he worked for four years at the Johns Hopkins University Applied Physics Laboratory in Columbia, Md. 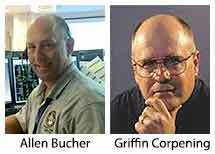 As for the Orion test flight, Corpening credited his fellow UW alumnus, Bucher, and his team for making sure all the voice and video links were in place to support the mission. The six control rooms were spread across the country; an avionics lab in Denver also was tied in; and there were many video feeds on both the East Coast and at the recovery site in the Pacific Ocean 270 miles west of Baja, Calif.
“All this worked flawlessly because of the effort of Allen’s team tying everything together,” Corpening wrote. Bucher, originally from Thermopolis, received his master’s degree in computer science from the University of Colorado in 1989 after his undergraduate work at UW. He worked for Lockheed-Martin before his career with Advanced Solutions Inc. He has helped provide ground voice and data communication systems for numerous space missions, including 12 unmanned planetary spacecraft missions. NASA says the next Orion spacecraft also will fly without astronauts on board, but it will make a much longer flight, this time going around the moon. NASA and its commercial partners are designing Orion to take astronauts to a near-Earth asteroid in the 2020s, and to Mars and its moons in the 2030s.